There are only two things that I deep fat fry at home, my mom’s wontons and latkes. Her wontons are wonderful! They are the most requested dish from family members during the holidays or for special occasions! Even though they are fried, I try to use the best ingredients available. The wonton wrappers contain no MSG or GMO ingredients. The veggies and canola oil are organic. The frozen shrimp has the Seafood Watch “Good Alternative” rating and contains no preservatives. Serving portion is usually 6 to 7 wontons per person, so the amount of ingredients you will need depends upon how many people you are having at your meal. 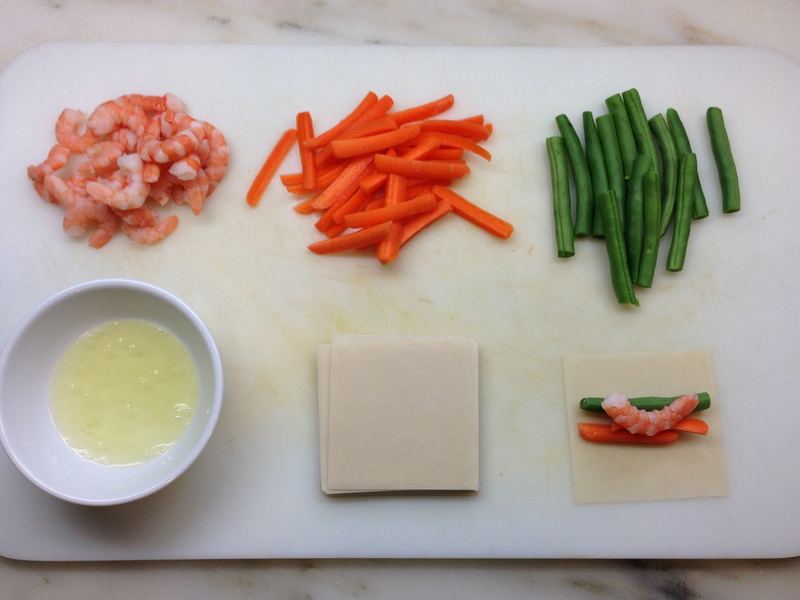 I find it helpful to use a cutting board to assemble the wontons. 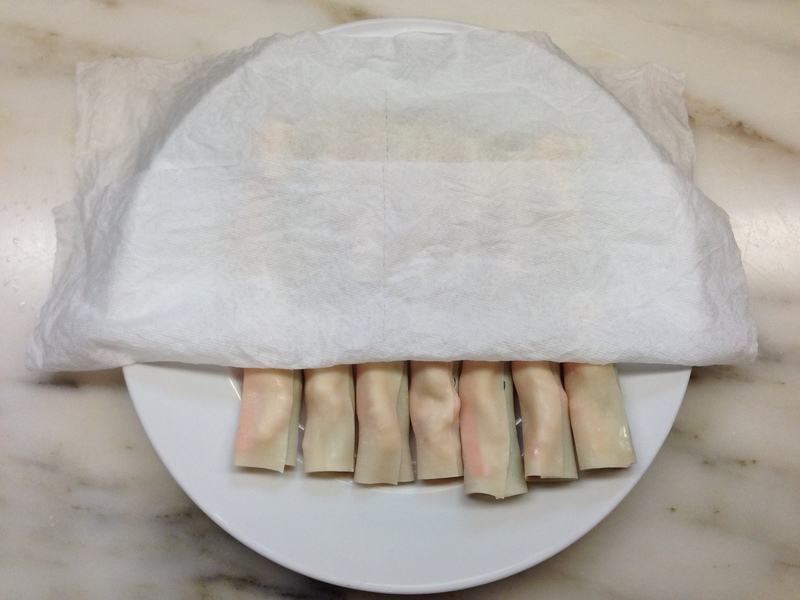 Use a damp paper towel to cover and prevent the wonton wrappers from drying out. 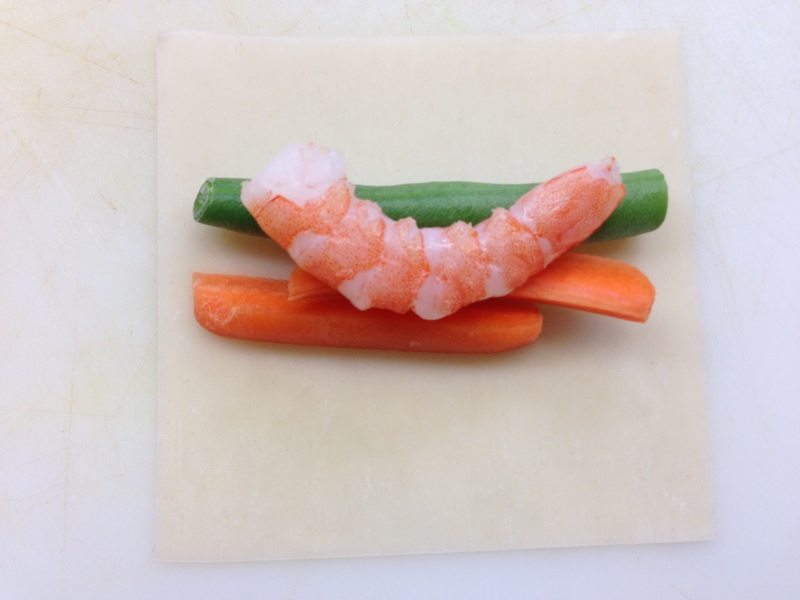 Place green bean, carrot and shrimp on wonton. 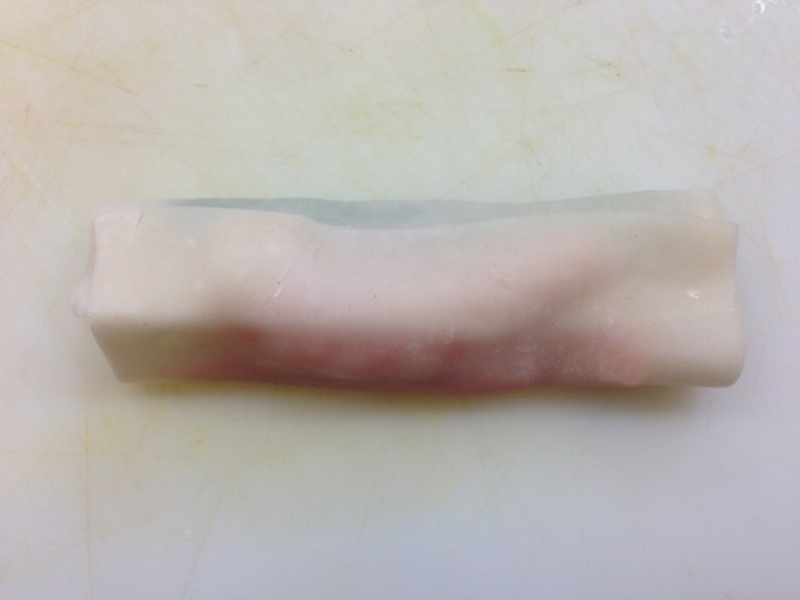 “Fold” the top part of wrapper down, then dip a finger in the egg white and “brush” across the bottom half. 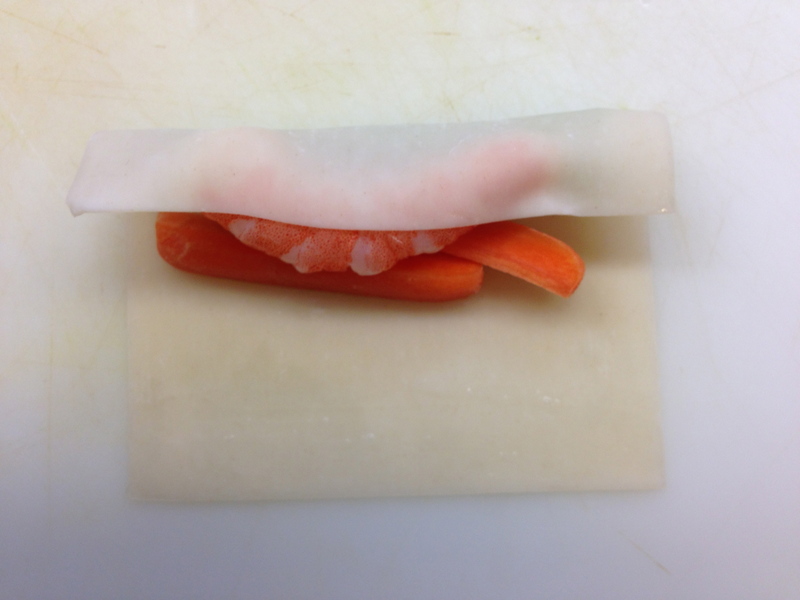 Bring the bottom half of the wrapper up and press firmly, so that the end is sticking to the rest of the wonton. 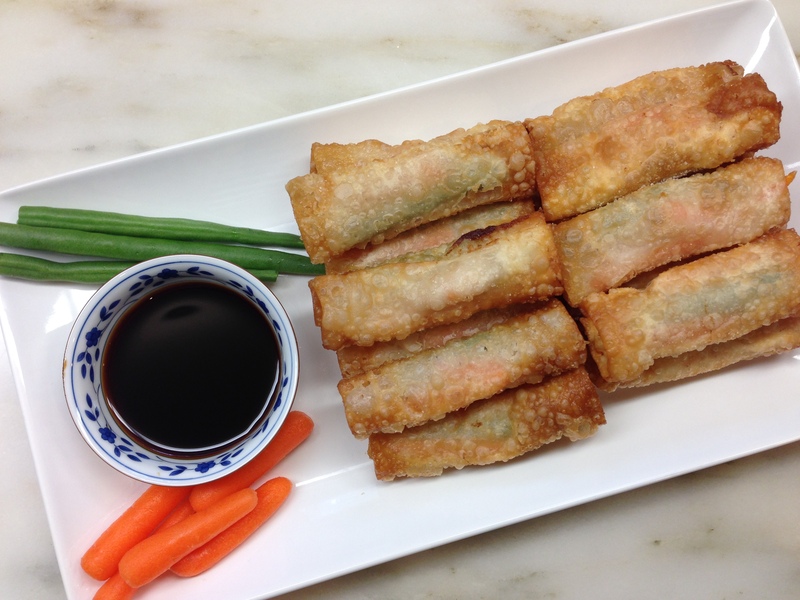 Place wontons on a plate or platter and cover with a damp paper towel until you are ready to fry. Heat oil over high temperature in a wok or a pan with some depth. I like to test the oil temperature by frying a small piece of wrapper. Fry until golden brown. 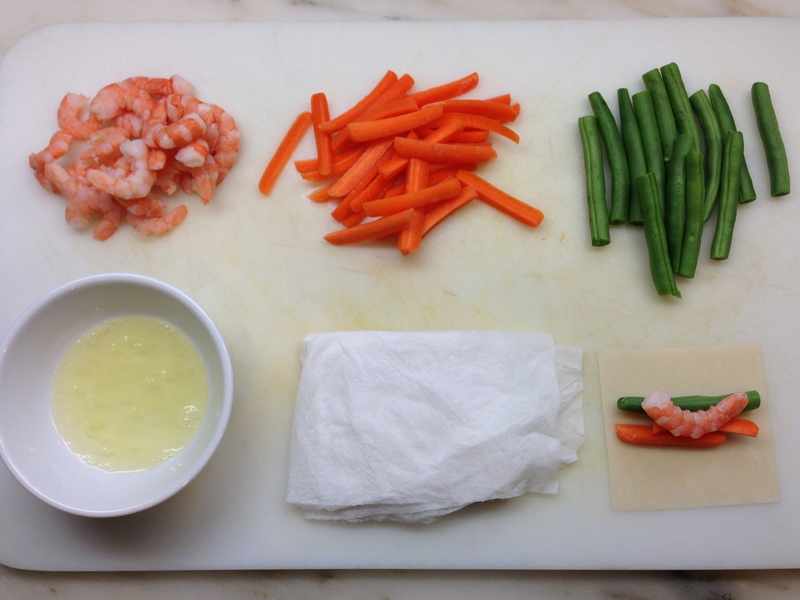 Using tongs gently shake off excess oil from the cooked wonton, then put on a plate lined with paper towels to absorb oil. Lightly salt and serve with soy sauce. Shrimps are my favourite. Just loved your recipe and style of presentation. I invite you to visit my blog to see the indian way of cooking prawns . Thank you, Sari. By the way, enjoyed your blog!